Need to entertain a taby? 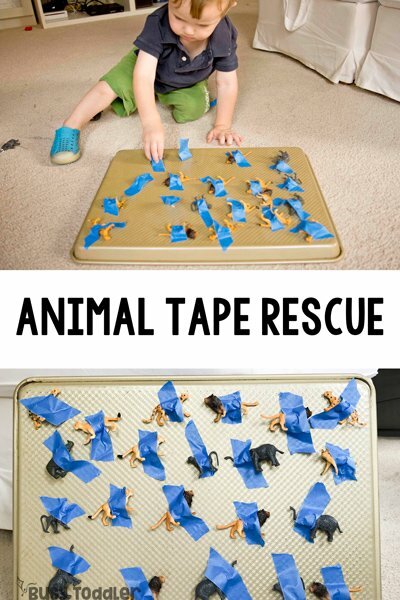 Grab a cookie sheet for a Tape Rescue Mission! Tabies are not the easiest group to entertain. I know that. 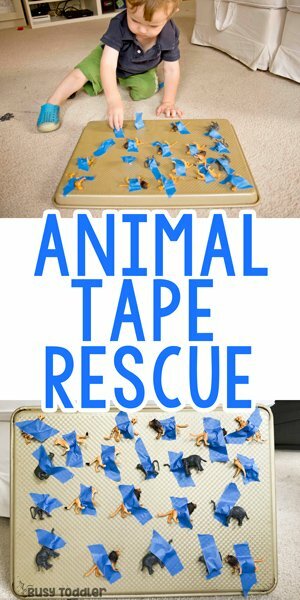 I’m a three-time taby veteran and I’ve learned a few things: they lick everything, they aren’t actually naughty on purpose, and they love tape… which is why tape rescue is perfect for them! 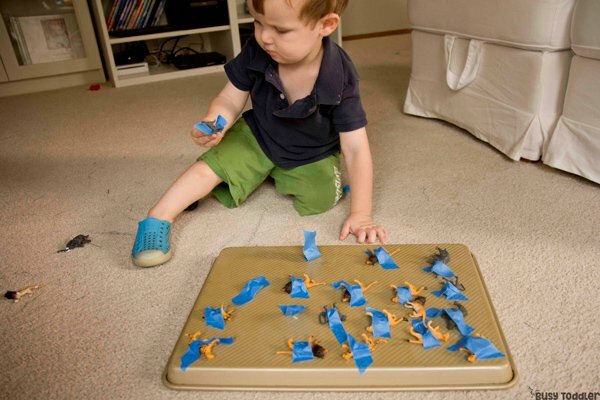 That’s why I made a quick tape rescue for my 22-month-old – something fun and easy to keep him entertained. 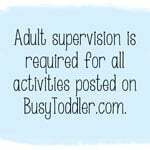 RELATED: Looking for more taby activities? 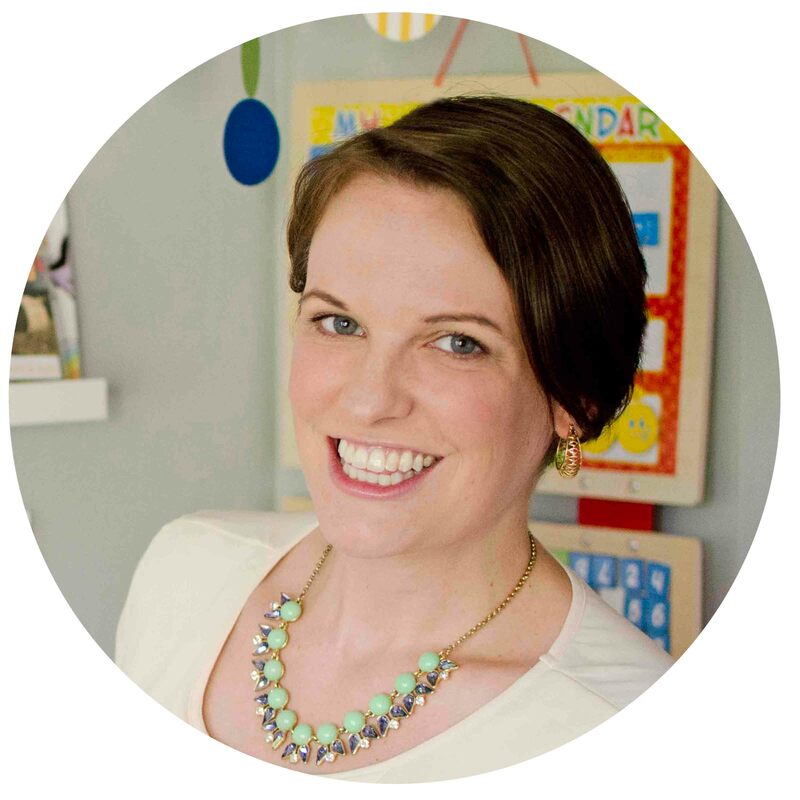 Check out my list of 30+ easy activities for one-year-olds. A taby is my silly little word for “nor quite a toddler,” but definitely not a baby. I call them “tabies” and boy are they a fun group to hang around with! You need to make a Tape Rescue for your taby! 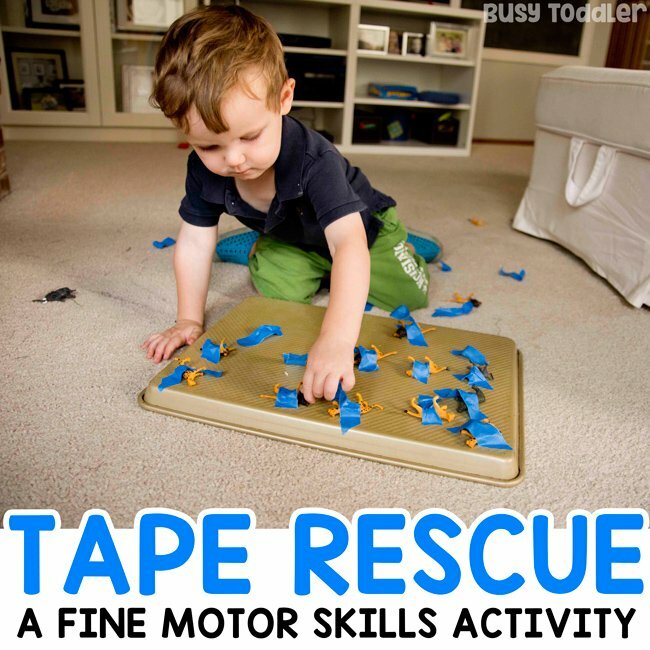 I first heard about tape rescue or rescue-the-toy type activities from Laughing Kids Learn and Mama.Papa.Bubba (two of my all time favorite blogs). 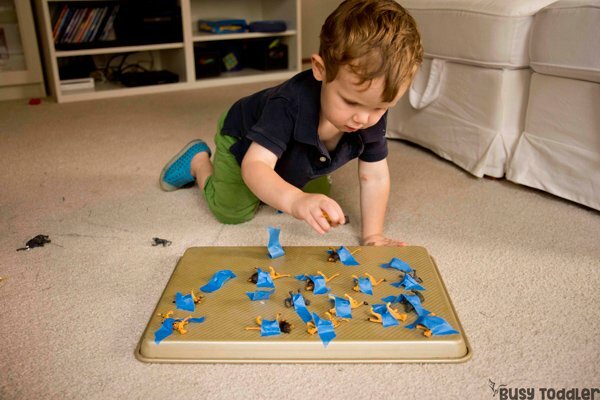 The idea is simple – use tape as an activity base. The tape alone or the tape with toys makes for one awesome way to get tabies (aka young toddlers) working, focused, and sitting still for half a second. I quickly ripped off a bunch of pieces of tape, flipped my cookie sheet upside down, and started hooking animals to it. The goal is for my taby to remove all the animals and the tape. It’s a hard job and a tall order for little fingers to do that kind of work! 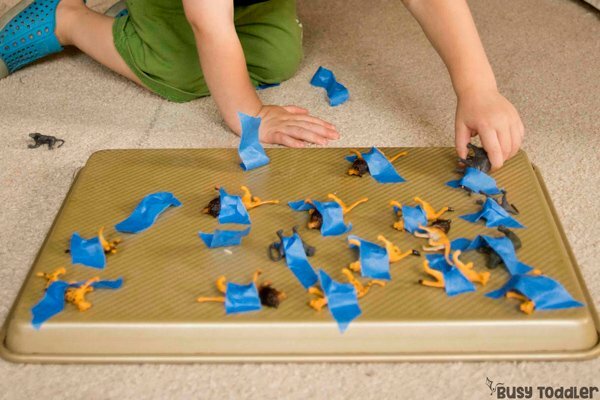 Getting the tape pulled up, getting the animal off the tape, and getting the tape off their fingers – it’s a lot of steps for a little one! Try this on an airplane! 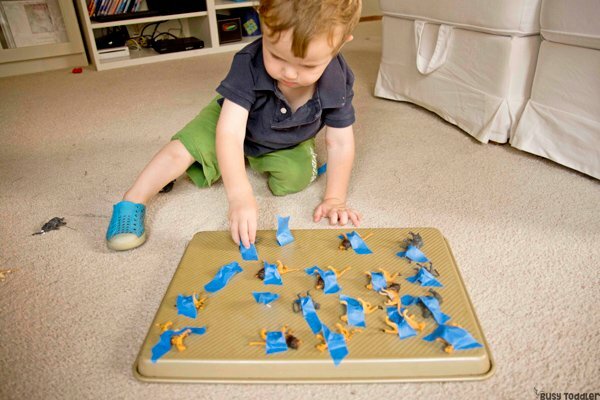 This is a GREAT activity for babies AND tabies for airplane rides. 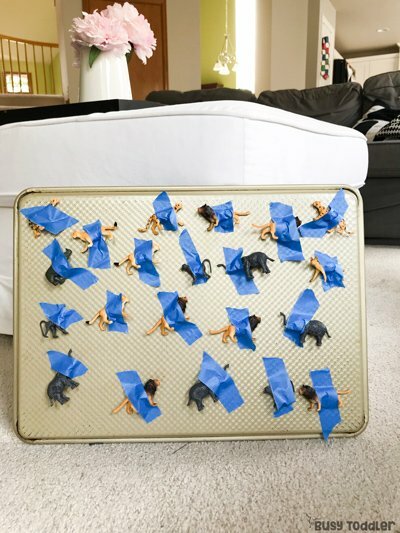 Set up the activity on the tray table – just pack some tape and animals with you. My taby is learning so much here! Just because an activity doesn’t look like much, doesn’t mean it isn’t full of great learning opportunities! Make a Tape Rescue Mission today! This is such a low commitment activity and one that’s so easy make. 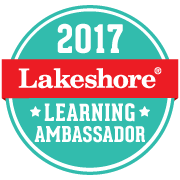 It’s a classic activity that gives our sweet tabies something to do, and something they can be successful at! When will you make a tape rescue?